As we roll on into the New Year, it is clear that machine translation is now pervasive, universally available, and easily accessible to millions across the globe on all kinds of digital devices. It is often even accessible when we are not connected to the web. This widespread access to, and use of MT is true across the globe and recent advances in translation quality from Neural MT have raised the profile of MT all over again. And while Google is a large provider of generic MT, it is not dominant across the globe, and we see that regional MT portals dominate local markets, e.g. Baidu in China, Naver in Korea, and Yandex in Russia. By my very conservative estimates, the sheer volume of translation done is astonishing, and I think the global daily use of MT is easily in excess of 500 billion words a day. 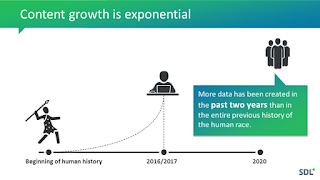 This amounts to approximately 185 trillion words a year, and this is if MT use does not continue to grow even further as new populations become more digital and connected! While the bulk of this use is by the consumer-at-large on the global internet, I think it is quite possible and even likely that a growing portion of this usage is uncontrolled use by a growing population of enterprise workers and many translators. The need for instant, largely accurate translation has now become a fundamental and often critical business requirement. MT is much bigger than what we understand as the reality of the total translation need from the localization industry perspective. The quality of MT can vary dramatically, be significantly less than "perfect", and still be hugely valuable. There are many business applications where the output quality requirements are a long way from perfect post-editability for MT to add value to the business mission. It is quite likely that the highest quality MT output today is seen in systems developed by experts in localization, but the evidence provided by the huge demand for raw MT use suggests that the real translation need is greater and broader than understood by localization experts. Based on data provided by Common Sense Advisory of the translation volumes in the localization industry, I estimate that currently the localization industry services less than 1% of the translation needs on the globe on any given day. Perhaps for business content that number is slightly higher, but ever so slightly. This suggests that the market opportunity for business translation can grow substantially. This growth can only come from a different strategy to what is translated and how it is done than it has been in the historical approach and focus. Thus, possibly the new leaders will create and move to a new industry business model where MT drives other translation activity, rather than the other way around. While addressing this larger market opportunity is only a potential strategy for a select few in the translation industry, I think few are as well positioned to lead the way and define this as SDL is today. Thus, I have decided to join SDL in a senior marketing strategy role as a “Language Technology Evangelist”. The Executive Management commitment to the role of MT in the organization and the future business strategy of the company which I touched upon in a post early last year. Their vision and understanding of the role and possibilities of using MT technology to drive deeper and broader engagement with global enterprises, I find is a refreshing contrast to the narrow localization MT perspective that still pervades much of the thinking in the industry. The relatively new management team has a strikingly different perspective from the prior management, and I believe they see the potential of using SDL’s substantial MT competence to drive a larger presence for business translation in the broader enterprise translation market that lies beyond localization. The depth and overall NLP (Natural Language Processing) and ML (Machine Learning) competence that exists within the technology team is, in my opinion, a significant long-term competitive advantage. 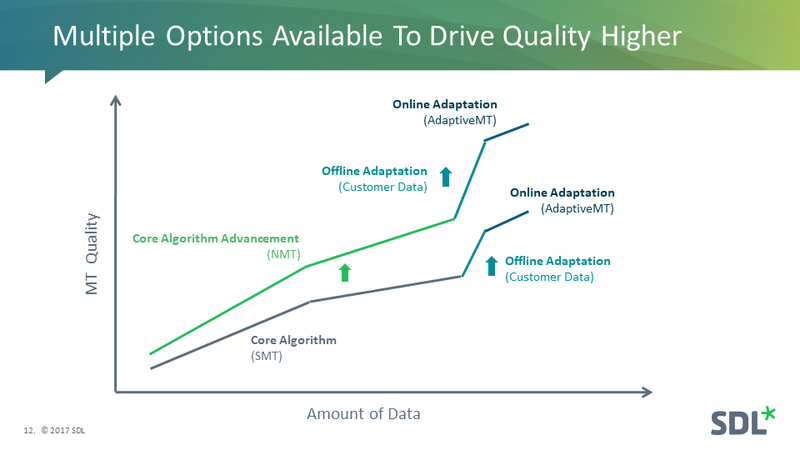 In contrast to the teams at Google, FB, and Microsoft, the SDL team is focused on developing MT solutions that are optimized around global enterprise needs and use-cases. It is my opinion that the capabilities and competence of the SDL MT team are beyond the reach of other large LSPs, and also quite probably of many smaller MT vendors. This ability to tune and customize the technology to specialized business use-cases requires deep knowledge of the underlying technology, and those who work with open source toolkits are clearly at a disadvantage. SDL has regularly beat out competitors in customer-driven quality evaluations, but much of this is under the radar and not well known. SDL also has a long history of deploying their MT technology in Government National Security user environments where system robustness, scalability, elasticity and overall manageability REALLY matter. This experience is excellent preparation for the larger enterprise MT market which has many of the same organizational needs. Today, SDL is the only MT technology vendor that has enterprise-grade SMT, Adaptive MT, and Neural MT solutions in place. 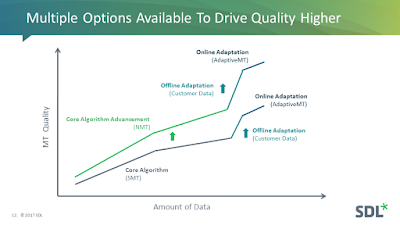 This competence allows ongoing comparisons internally of how different data sets can be optimized across these technology alternatives to optimize for the business purpose in ways that are not easily possible by competitors. It matters more that the business purpose is achieved and much less what technology is used. The engineering team here has many patents to their credit and have published hundreds of papers on ML strategies, SMT techniques, NMT and Adaptive MT. 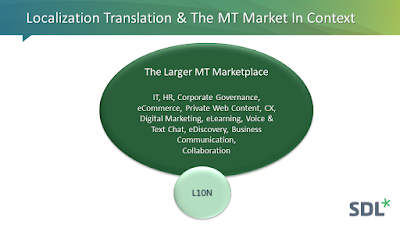 The experience of Internal Translation teams working with MT over an extended period has built unique capabilities and a deep understanding of successful MT technology deployment. SDL is one of the few language service companies that have a large team of internal translators. This fact enhances the possibilities of building a more comprehensive Linguistic Steering & MT Development collaboration when the highest quality output is required. This is one of the reasons why SDL has such a robust Adaptive MT offering. 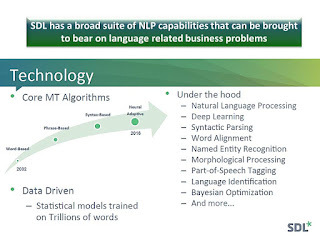 The deep collaboration between expert NLP engineers and expert linguists has only just begun, and I believe that as this engagement expands, SDL will have the potential to build distinctively and consistently superior MT engines that are optimized for enterprise use. Enterprise MT solutions also require specialized process infrastructure that surrounds MT in a business use scenario, and the long-term internal MT use experience that SDL has had provides great insight into building this process infrastructure for clients whether they are global enterprises or LSPs. The quality and robustness of the surrounding processes around MT deployment are key to maximizing MT benefits. This interaction between computational linguists and human linguists where needed could also enable new kinds of AI and machine learning driven process improvements at several different points in new business translation workflows. Having competent linguists involved with your MT systems also results in data refinement over time. Many are now beginning to realize that the data is the highest value asset in a world where the best machine learning technology is only as good as the data it learns from. The existence of a linguist team that understands the learning implications of "good data" vs. "bad data" creates the possibility of having the most valuable, cleanest and most relevant data for the new AI frontiers. When these three factors are placed in the core competency portfolio and context of a company that already has deep penetration into Global 1000 Enterprises and Major Government Agencies around the world, the potential for further success is indeed great. The initial engagement with the Global 1000 that SDL already has makes the likelihood for a broader and deeper business relationship to develop around new international initiatives and needs even more likely. From my historical vantage point as an independent industry analyst, it is easy to see that the SDL MT offerings are already formidable and unique, and hopefully, with my involvement this will only become more so. While it is important to consider these relatively objective assessments of organizational strengths and characteristics in choosing one’s employment, I think the personal factors around the choice are possibly even more important. The following are the ones that immediately come to mind. The People: I have enjoyed my interactions with many SDL employees in my various roles as an analyst, collaborator, and potential employee. The straightforward and clear communication styles and professional personal manner of the key executives I dealt with encouraged me to consider taking on this new role with minimal hesitation and consideration. In a way this was also a homecoming, as I originally entered the world of translation in a leadership position with Language Weaver (acquired by SDL in 2010), except now it has better management, better focus, and more resources. And also hopefully I too am wiser and smarter, as my new grey beard suggests. I plan to keep this blog going and will continue to produce or curate what I consider to be high-value content on the subjects of Translation, MT, AI, ML, and Collaboration. This is done with SDL Executive permission (and possibly even their blessings) and again points to the openness of the SDL culture and new management. SDL does not necessarily agree with everything that I say on this blog but sees the value of serious content sharing forums. I will, of course, endeavor to keep this blog from becoming a marketing mouthpiece for SDL MT alone, and will try my best to keep it objective and issue focused. There is great value in intelligent dialogue and discussion, and I will strive to maintain this here. While this post clearly shows where my allegiances and biases lie from this point on, I will always strive to be fair and allow different viewpoints to be heard. I have always considered it a great and important skill to listen, to listen to everyone, especially those with a different worldview. I have been a long-term MT and translation technology evolution advocate, but I have also found that it is possible to communicate respectfully and meaningfully with translators and opponents of MT. The regular contributions by translators as guest writers or in the comments on this blog is a testimony to that. I hope to maintain that open dialogue quality and the overall respectful cultural characteristic of this forum. I invite guest writers who have an interest in sharing insights and new perspectives on the primary themes of this blog. There is also great value in being an insider and seeing the challenges from the inside in contrast to the view that is offered to a consultant. As an insider one has the opportunity to shape and change the outcomes in a much more substantial and organic way. I look forward to this new insider role in helping to shape the future of SDL MT. This role will also allow me to engage with many more actual MT deployments and possibly have a role in helping to drive many more successful outcomes. My first public-facing SDL event will be a webinar on February 27th. I look forward to seeing you there and I look forward to ongoing honest and forthright dialogue.